This anime is your cookie cutter "Forced bride and groom into marriage because the grandparents/parents set it up when they were little" type of anime. It has really smooth art and interesting characters. All of the characters play a role and it never gets too dull most of the time. Give it a try. I am black. If you are here for a charming, teen romance with with a twist then this is the right anime for you. Art style: The art style for this show is amazing in my opinion. With a nice bright colour palate and clear lines it made me feel right at home while watching this. Animation: The way things move in this anime it is just great. From hair moving to people walking and jumping. Its nice and fluid with just the right amount of exaggeration. Voice acting: I do not speak Japanese but i can tell if a voice fits a character. The way the actors execute their characters voices is good from normal chats to screams and moans(its not that kind of anime though if you know what I mean). Fan service: I like how the creators didn't go overboard with fan service for this show. I was surprised with how little there was, considering how many girls are in this anime. But! There was quite a few references to Kobeni's body like breast size and figure but thats it. There was no 'bath house episode' which is basically the episode that I refer to the 'fan service' episode. There is some fan service in the theme though but not too much its just stills shown for about half a second. Music: The characters in the show sing the theme and the extro which in my opinion is great. Also I love the theme and the extro. At first I thought they were OK but after a few episodes they grew on my and I began to love them. Story: The story starts like most romantic animes. Someone from ones past comes back and the other person doesn't remember them. The reason this is mixed and not a con is that I don't have a problem with this plot intro, yet, but someone else might have a problem with it. Characters: This isn't a con for me but all the characters are women except for Kobeni's fiance. If i wasn't so biased I would have come up with more cons but I couldn't come up with any. finish it in about 4 1/2 hours. This anime is great and has squeezed its way into my top ten. Just go watch it. - Kobeni, the main female lead, has got to be one of the cutest, most lovable characters ever made, and not cute like characters who were specifically designed to be cute, Kobeni is cute because she's just normal, and likes to do normal things. Can only be described as "Wifey material." - A time waster on the same ranks as Lucky Star and Azumanga Diaoh, yet actually has a plot that keeps the story going. - Kobeni is drawn to be a little more plump than the other characters, which actually adds to the cute/attractiveness, as her physical features seem more realistic. -You call that an ending? Engaged to the Unidentified in the nutshell: Cuteness and lighthearted fun all around, but if drama, action, or suspense is what you're looking for, best skip this title there is none of that for you here. Fun, Relaxing, yet non-cliche SoL! I wasn't into Slice of Life shows much before but Engaged to the Unidentified has really changed my view on them. If others are anything like this then what a breath of fresh air! The story is simple yet characterization is great, there's not a single lackluster or unlikable character. I can't help but grin through each episode, with plenty of honest laughs. Watch it! This is a great anime for anyone. Beginners or seasoned anime watchers; it also shines brighter due to its unique story and plot line. This anime follows a much less seen story where, although you don't get much depth from the characters you still are able to relate and therefore stay interested in the story till the end. This is also one of the few animes which has a "happy ending" but not in a defined way. Meaning the viewer will be able to have their own unique thought on how the story ends. Sure it has stereotypes but they aren't beaten into your head with a club every five minutes like some anime out there. Will now be one of my favorite anime! This anime literally had me laughing out loud. It has a fantastic blend of comedy and romance without any cheesiness. The characters are well thought out and developed. The story is intriguing, engaging, and makes you want to binge watch the show repeatedly. Again, the comedy is just spot on and hilarious. And at the end I just want them to scream they love each other and get married already. Please can I has season 2 now? This anime is now one of my top favorites! 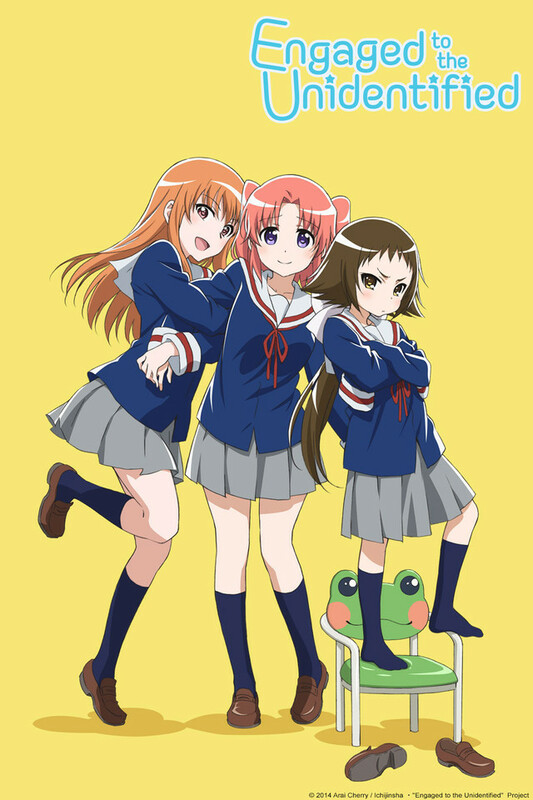 I watched this show after i had started "sakura trick" and "recently, my sister is unusual" and i must say i was instantly drawn in. This anime really is a great mix between comedy, romance, adorableness, and low-tense sexual jokes. I would recommend this show to anyone. Similar shows you may enjoy: "My Little Monster" and the others i listed in here. The song is so weird because it tells you what she thinks of everyone. But who knows what happened to the others. It also shows everyone so tiny and cute........................ ............. . . . .